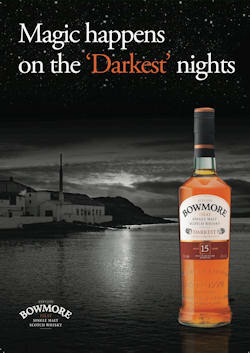 MARCH 2012 – This year Bowmore, the first Islay Single Malt whisky, is launching an exciting marketing campaign Magic Happens on the ‘Darkest’ Nights to support the growth of its multi-award winning core expression, Bowmore 15 Years Old ‘Darkest’. The new integrated campaign will see a series of innovative activities rolled out globally and will span advertising, digital, PR and on-trade/off-trade marketing activity. Bowmore whisky is widely acknowledged to be the most perfectly balanced in the world; the new campaign will support the trade in offering this interesting and complex (not just smoky) Islay expression to Single Malt enthusiasts as well as expand distribution. Bowmore 15 Years Old ‘Darkest’ is the outcome of 12 years maturing in American Bourbon casks,followed by a three year finish in Oloroso sherry casks, resulting in warmth, depth and a burnt sienna colour – all providing inspiration for Magic Happens on the ‘Darkest’ Nights. This consumer proposition allows the brand to explain the meaning behind the name ‘Darkest’. Kicking off the campaign is the consumer event Magic Happens on the ‘Darkest’ Nights in London in April; a theatrical and immersive experience where guests will be taken on a sensory–filled journey that brings to life Bowmore 15 Years Old ‘Darkest’, Islay and its myths and legends in a multi-roomed venue. The event partners with Master Chocolatier Paul Young from Paul A Young Fine Chocolates, stargazing experts from the Kielder Forest StarCamp Observatory, pop-up culinary experts Hidden Dining, and Gideon Reeling, purveyor of bespoke theatrical interactive experiences. Similarly in May, Bowmore will host the only headline event at the Manhattan Cocktail Classic in New York – the annual festival of cocktails and culture. Here, Bowmore will present a performance of cult phenomenon immersive theatre Sleep No More by Punchdrunk, the pioneers of immersive theatre. Bowmore’s collaboration with Paul A Young will also continue through 2012. For one of the darkest and most magical nights of the year – Bonfire Night – the groundbreaking Master Chocolatier is creating the perfect hot chocolate serve using Bowmore 15 Years Old ‘Darkest’. The expression is incorporated into a dark chocolate ganache bon bon, which the consumer thenstirs into the hot chocolate drink and watches as the ganache and whisky melt away. All consumer activities will be housed on a newly designed microsite focusing on the ‘magic’ of ‘Magic Happens on the Darkest Nights’. The site will feature Bowmore influenced online magical illusions that use video, interactivity and animation to create an immersive experience. The microsite will also incorporate information aboutsampling events and competitions. To support the on-trade, a new series of intimate consumer events Darkest Nights will take place at premium accounts across the country, where guests can experience stargazing, in-depth whisky tastings and food pairings. Bowmore 15 Years Old ‘Darkest’ chocolate perfect serve kits have also been specially designed to create a memorable and theatrical serve experience. To complete the support, three classic whisky cocktails – Rob Roy, Rusty Nail and Blood & Sand – have been tailored to complement the ‘Darkest’ fruity notes and smokiness. Unique sensory sampling activities using Bowmore branded blindfolds and bespoke chocolates will also be available for select off-trade accounts. The activity will allow consumers to explore the depth of taste with dark chocolate and communicate the Bowmore 15 Years Old ‘Darkest’ flavour notes. Cara Laing, Brand Manager of Bowmore, comments: "We are hugely excited to be showcasing our 15 Years Old 'Darkest' as a core member of the Bowmore range. The spirit is truly exceptional and a firm favourite with trade and consumers alike. The new campaign allows us to explore new marketing platforms such as chocolate pairing and even astronomy!" Rachel Barrie, Master Blender of Morrison Bowmore Distillers, comments: "To me Bowmore 15 Years Old ‘Darkest’ is the dark and alluring side of Bowmore; a rich and beguiling malt that fusessherry and peat smoke together in perfect harmony. Seductive smokiness is balanced by rich dried fruit, treacle toffee and chocolate sweetness, with a drizzle of lime and sprinkle of sea salt to slice through the indulgence. With its wonderfully warming and velvety texture, it is perfect to warm your soul as darkness descends. Relax, sink into your chair and savour the spirit of ‘Darkest’."